The engineers and development team at Hexbot developed a robotic arm that could be versatile and affordable while keeping an entry-level feel so that anyone might want to try it. Their clever tagline is ‘turn your desktop into a workshop’ and the group is running a Kickstarter funding campaign for the first production run of their Hexbot All-in-1 Desktop Robot Arm for Everyone. The big selling points for the Hexbot arm are its 0.05 millimeter repeatability, and the ability to change out several heads and give the robot an array of functions. 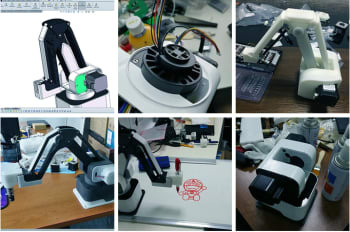 The standard end effector is a pen holder for plotting or drawing, and modular heads can be added for laser engraving, 3D printing, pick and placing, and vision recognition. A touchscreen controller is available to control the robot end point in the x, y and z directions or the user can program using Blockly. The application programming interface will also give the option to use Processing, Python, or standard g-code. Drawings, 3D prints, and laser engraving can be processed or sliced through the Hexbot proprietary software. Hexbot’s dimensions are 175 x 128 x 315 millimeters and the full bot weighs 2000 grams. The touchscreen attachment is 3.5 inches tall and attaches through one of Hexbot’s four USB-C ports. Maximum payload is 500 grams and the maximum reach is 220 degrees in a 380 millimeter radius. Speeds range from 200 to 500 millimeters per second. The 3D printing head uses 1.75 millimeter PLA, with the same 380 millimeter, 220 degree build volume and a resolution between 100 and 300 microns. Three suction cups of sizes 5, 10, and 20 millimeters can hold a payload up to 500 grams. The laser engraver is 250 milliWatts and supports wood, leather, plastic, fabric, paper, and non-transparent acrylic. At this time there are already 143 comments left by robot enthusiasts eager to learn more about the system, and I’ll be watching over the next few years to see how well the quick connect modular head stays in place and maintains electrical connection over time. Hexbot has blown past its modest $50,000 funding goal and the campaign ends on March 9, 2018.